Rokkor was the brand name Chiyoda Kōgaku Seikō and subsequently Minolta used for its camera lenses. 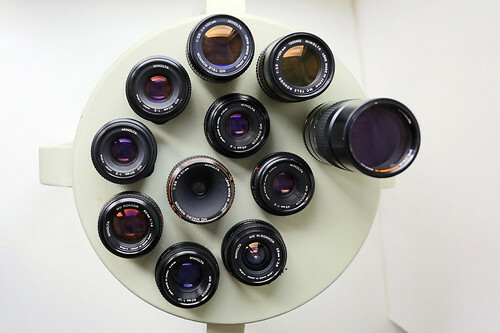 The great majority of these lenses only fitted the company's own manual-focus 35mm SLR camera bodies or compatible products like those of Seagull. Others were part of fixed-lens cameras. Chiyoda also made Rokkor lenses for its Leica-thread-mount rangefinder cameras; these lenses may of course be used on Canon, Cosina Voigtländer, Leitz and other Leica Thread Mount cameras. The name Rokkor is derived from Mount Rokkō (六甲), a mountain near Osaka that could be seen from Chiyoda's Mukogawa factory; it was probably also inspired by the name Nikkor used by Nippon Kōgaku from 1932. It appeared for the first time in 1940 on the 20cm f/4.5 lens of the SK-100 handheld aerial photography camera (百式小型航空写真機SK). The first civilian camera equipped with a Rokkor was the Semi Minolta III, with a 75/3.5 lens that also happens to be the first Japanese coated lens commercially available. 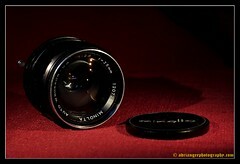 However, a Semi Minolta II has been observed with the Rokkor 75/3.5 lens, see the discussion in the corresponding page. In February 2019 JMM Lee Properties, LLC, registered the trademark Rokkor as its own! Thus former brand owner Konica Minolta must have given up the idea to return to camera lens production. JMM Lee is owner of EBI which alreay markets digicams under another revived brand: Minolta. It's also the agency that markets Samyang lenses branded as Rokinon. If coming Rokkor lenses will be from Samyang is not yet known. Most important the interchangeable lenses in SR mount for the manual SLR system. Even the lenses built after 1981, which had no Rokkor designation (e.g "MD 50mm 1:2") are still often called "Rokkors" by Minolta users. The focal length range reached from 7.5mm up to 1600mm and there were more than 40 lenses to choose from. The early lenses bear a letter combination that spells out the optical configuration of the lens. Auto Rokkor lenses had an automatically set aperture to enable focusing at open aperture with exposure aperture value already set. 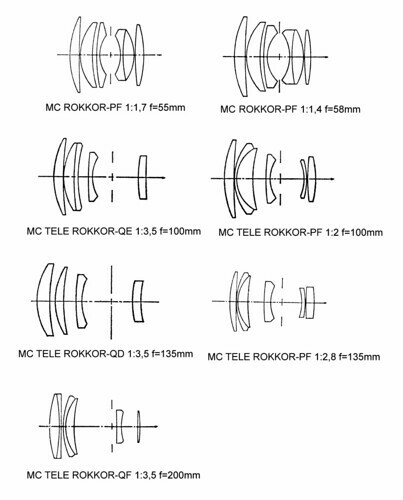 MC Rokkor lenses have in addition "multi-coating". That means more than one lens surface coated, thus allowing more complex lens constructions, i.e. lenses with more groups of elements. A handful of new fast lens constructions for the MC line based on self-developed optical glass made Minolta a remarkable camera lens maker. The MC lenses became standard since the introduction of the legendary Minolta SRT 101. For the coupled meter of the camera the MC lenses transmit mechanically the set aperture value to the camera body. 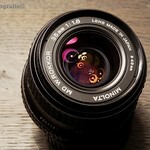 MD Rokkor lenses have in addition the mechanical ability to let the camera set the aperture value. The Minolta XD cameras and the Minolta X-700 are capable to set aperture automatically that way in their shutter priority or program modes. The MD series arrived with a handful of quite compact new fast lens constructions. W.Rokkor means wide-angle lens type. Tele Rokkor means tele lens type. a two-letter code says something about the lens architecture: First letter may be T, Q or P for tertia, quarta or penta (3, 4 or 5) groups, and the second letter indicating the number of elements: C, D, E, F or G for 3, 4, 5, 6 or 7 elements. Thus a Rokkor-PF has P=5 groups and F=6 elements. A Rokkor-X was a model dedicated for the American market. There was a small number of Rokkor lenses for the rangefinder cameras Leitz Minolta CL and Minolta CLE in Leica M mount. The Minolta 35 used interchangeable Leica-thread-mount 'Super Rokkor' lenses. 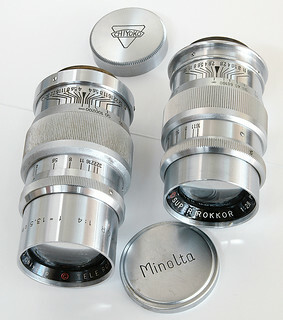 The Minolta Super A featured interchangeable special bayonet-mount lenses, also marked 'Super Rokkor'. All rangefinder cameras and viewfinder cameras like those of the Minolta Hi-Matic series had a Rokkor lens built in. The fixed lens SLR Minolta ER had a fixed Rokkor standard lens with wide angle and telephoto auxiliary lens attachments. Rokkor 21cm f/4.5 lens no.1100002. Military Rokkor lenses were produced during World War II for the SK-100 aerial camera. Only the Rokkor 20cm f/4.5 and Boen Rokkor 40cm f/5.6 are confirmed to exist. (The word bōen 望遠 means "tele".) Many sources mention a Rokkor 50cm f/5.6 instead of the 40cm f/5.6, but this is perhaps a confusion. An uncoated lens engraved Chiyoko E. Rokkor 3,5/75 mm has been reported on a Konishiroku GSK-99 aerial camera, but this is probably an enlarging lens fitted to the camera as a repair. The subminiature cameras of the Minolta 16 line have special built-in miniature Rokkor lenses. The Minolta 110 Zoom SLRs have built-in Rokkor zoom lenses. The Autopak camera series for the 126 and 110 film cassettes have miniature Rokkor lenses too. Some Rokkor lenses were made for enlargers. ↑ Francesch, p.26, Ema, p.90 of Kurashikku Kamera Senka no.12. ↑ Francesch, p.26, and this page at Minoltan (archived). ↑ According to this page of the Konica Minolta official website (archived). ↑ Chiyoda Kogaku 21cm f/4.5 Rokkor (the lens pictured here), sold as Lot 723 at the sixth Westlicht Photographica Auction, in November 2004. ↑ Rokkor 20cm f/4.5 pictured in Sugiyama, item 6013; Boen Rokkor 40cm f/5.6 pictured in this article. ↑ The Rokkor 50cm f/5.6 is mentioned in Sugiyama, item 6013, in Kurashikku Kamera Senka no.12, p.18, in Francesch, p.253, and in this page by Dennis Lohmann. All these sources list two lenses only for the SK-100: the 20cm f/4.5 and the "50cm" f/5.6, and none mentions the 40cm f/5.6. ↑ Reported by Auction Team Köln on a Konishiroku GSK-99, lot #810 of the 25 November 2006 auction. Ema Hiroshi (江間宏). "Rokkōru renzu no hanashi" (ロッコールレンズの話, Rokkor lens stories). Kamera Rebyū: Kurashikku Kamera Senka (カメラレビュー クラシックカメラ専科) / Camera Review: All about Historical Cameras no.12, October 1988. No ISBN number. Minoruta kamera no subete (ミノルタカメラのすべて, special issue on Minolta). Pp.90–3. Francesch, Dominique and Jean-Paul. Histoire de l'appareil photographique Minolta de 1929 à 1985. Paris: Dessain et Tolra, 1985. ISBN 2-249-27685-4. "Minoruta no gun'yō kamera" (ミノルタの軍用カメラ, Minolta military cameras). Kamera Rebyū: Kurashikku Kamera Senka (カメラレビュー クラシックカメラ専科) / Camera Review: All about Historical Cameras no.12, October 1988. No ISBN number. Minoruta kamera no subete (ミノルタカメラのすべて, special issue on Minolta). P.18. This page was last edited on 17 February 2019, at 12:39.